Ice cream is obviously a no-no on this dairy-free diet The rice ice cream that I've been able to find is made on dairy contaminated equipment. The same goes for commercially made sorbets. So those are all out. That leaves making it myself! 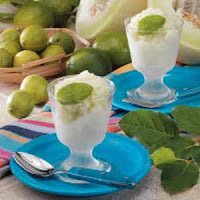 Here's a recipe from Taste of Home that should help cool you down this summer!